Happy rainy Friday! If you live anywhere along the east coast, you’ve likely been drowning in windy, nasty weather all week. ☔️???? Here in New Jersey, the weather reports all indicate that the rain won’t be letting up anytime soon. I have to say, though, it’s actually nice to have a rainy weekend on the horizon. There’s less pressure to go out and do something because everyone just wants to hunker down and do nothing. I love activities, but man, I really love doing absolutely nothing, and it seems like such a rarity these days. For a lot of folks, “doing nothing” on the first weekend in October pretty much equates to watching a lot of football. And while I can’t say that’s quite how I’ll be spending my weekend, I do have a recipe that’s the perfect snack for both football-watching and nothing-doing alike. Buttery. Buffalo. Popcorn. YES. It’s spicy, tangy, and just a little bit sweet; a flavor profile I picked up from an iconic local dive bar that’s known for their sweet take on buffalo wings. If you’re from South Jersey, you definitely know I’m talking about the Pic-a-Lilly, and if you don’t, you need to go find out STAT. That little hint of sweetness calms down the spice and gives that addictive sweet-and-salty quality that you just can’t get enough of. 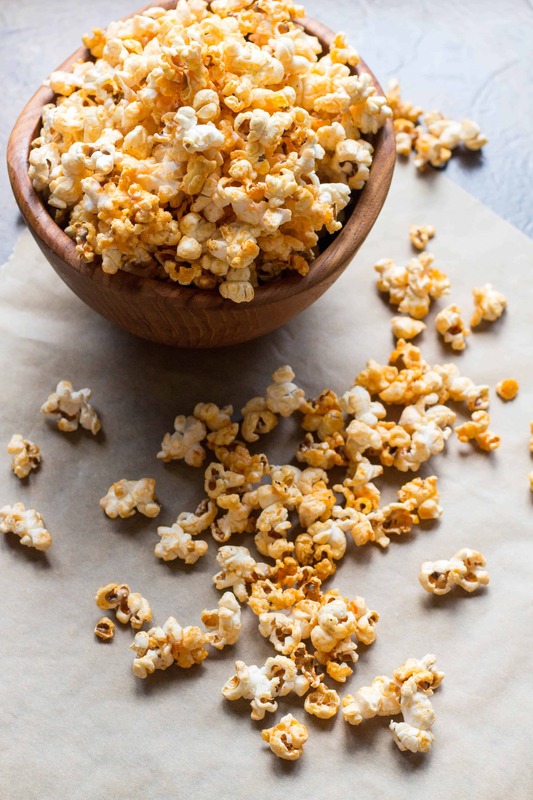 In addition to the spicy, tangy and sweet notes, this popcorn is also super buttery. 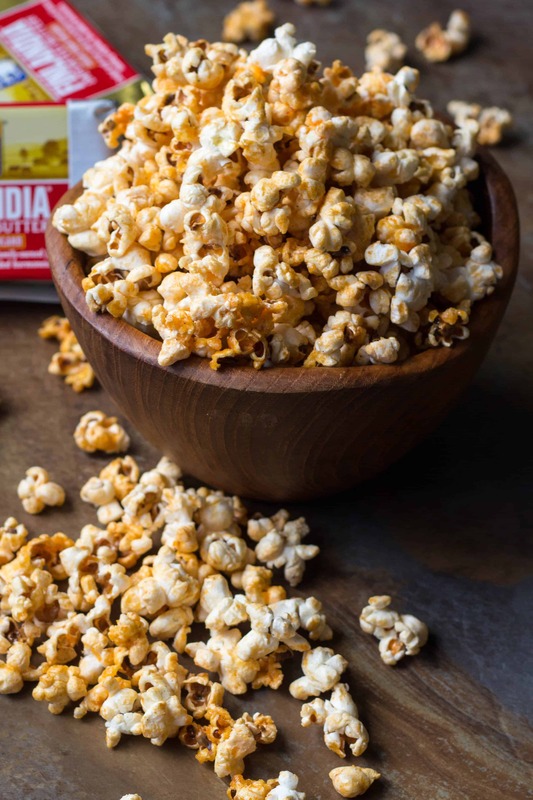 Not only is butter a key ingredient in buffalo sauce, but butter and popcorn are well known best friends. I use Finlandia butter, which is new to the US market (but you may have had their cheeses), and it’s definitely worth trying. It’s a real, imported European butter, which means it has a higher butterfat content than regular butter. And since it’s made from the milk of (mostly) grass-fed cows, it has a deeper, more pronounced buttery taste. This recipe makes enough for two people, but I can easily polish off a batch on my own. It can be scaled up to serve more, but I highly recommend doubling – or even tripling – the recipe, even if it’s only for two (or, um, one if you’re me). You won’t be able to stop eating it, and by eating, I mean shoveling it into your mouth like a lunatic (guilty). I’ve partnered with Finlandia to create a series of videos using their products in some really awesome recipes, so be prepared for lots more buttery, cheesy goodness to come your way this fall. Preheat the oven to 300 degrees. Pour the honey and hot sauce in a small pot over medium heat and bring up to a simmer. As soon as it begins to bubble, turn off the heat and stir in 4 tablespoons of butter until melted. Set aside. Heat the oil and remaining tablespoon of butter in a large pot over medium high heat. Add the popcorn kernels, give the pot a shake, then cover and turn the heat down to medium. Wait for the kernels to begin popping and give the pan a shake every so often to help the process along. 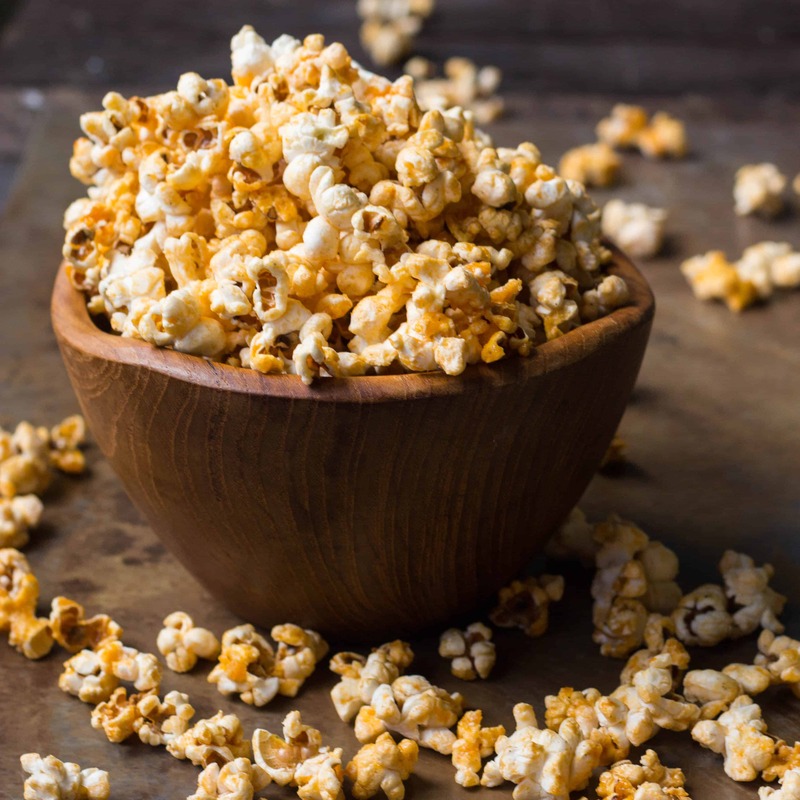 Once the kernels begin to pop, crack the lid open a tiny bit to allow some steam to escape. Once the popping slows to a few seconds between pops, remove the lid and pour the buffalo sauce all over. Stir until all kernels are evenly coated with sauce, then transfer to a baking sheet and spread out into an even layer. Bake for exactly 10 minutes, remove from the oven and let cool. Serve warm. Baking the popcorn in the oven allows it to dry out a bit and helps the seasoning to adhere. This step can be omitted if desired, however it will result in a wetter consistency. For a spicier popcorn, add 1/4-1/2 teaspoon cayenne pepper and if using unsalted butter, add 1/4 teaspoon of salt to the sauce. Corn has kernels, the army has colonels. NEED to try this ASAP Coley!! Sounds addictive!